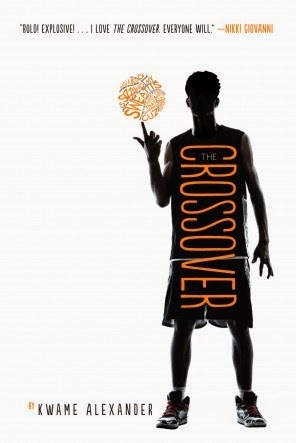 The Crossover is the story of 12 year old Josh, who is a gifted basketball player and all the complications and in his life. It follows Josh through the rough start of adolescence, a time when it seems like all his friends are changing and among them is his twin brother, J.B. The two of them have always been closer than close and focused in their love of basketball. But now JB cares about girls and is pulling away from Josh and basketball, which utterly puzzles Josh. The Crossover is also the story of Josh and his Dad - they have a playful, meaningful, and close relationship which motivates Josh in many ways. Alexander skillfully weaves all of these push-pull/good-bad elements of Josh's life together through the beat of the novel's verse. Kid readers might not even realize how many levels of the story, and of Josh's development, are happening because Alexander is that subtle and the verse is just that tightly composed. This is a fun book - and I use that in truly the best sense of the word. It's amazingly well-crafted, it's well-structured, it's all those fancy and jargon-y words we reviewers and grown-ups use and mean. But it's also just fun. It sounds fun. It makes you want to read it out loud and share it so other people can hear the words. Even when the story takes a more serious turn, you still savor Alexander's verse, you still want to feel his words. And, better still, because you feel like you KNOW Josh and have shared something with him iy really gives the serious events some impact. The descriptions of basketball games (in particular), Josh's confusing rush of hormones and emotions, and even family relationships flower fully in Alexander's prose and, I think, will make kid readers feel like they are talking to a friend, relating to someone whose life seems real. And just like there's a lot to admire in The Crossover, from how it's constructed to the story it tells with no moralistic head-thumping about family bonds, there's also a lot to love in it. And chief among those lovable and unforgettable elements is Josh. He's mixed up about why everything in middle school seems to be changing. He can't understand why the one person who he has always been closest to, JB, is pulling away from him. And, even with all that happening, the one thing Alexander makes clear with the sheer energy and passion of his verse is that Josh is in love with the game of basketball and the way it makes him feel. If there's one thing I truly adore in a work of fiction, it's a character who unabashedly loves something. When a character wants something, loves something, believes in something, it makes them real for me in the best of all possible ways because it makes me as a reader want, love, and believe in them. That's how I felt about Josh and that's how I think other readers will feel about him too. I also want to urge all teachers to think about using this book to teach poetry. Haven't you taught Love that Cat enough to take a year or two off? There are many different forms of verse in the book and it really uses poetry to define voice, character, and setting. The way Josh unites his love of poetry with his love of playing basketball (no conflicted fake drama about that, by the way, Josh is simply a young man who loves and excels at both things. Another glorious detail!) will make poetry seem alive and approachable to many students who may have thought of it as a stale chore. The Crossover is highly recommended, especially for readers looking for something really engaging and different in middle grade. It's a stand-out in the genre, a fantastic example of the kind of story arc and character development that makes middle grade its own distinct - and valuable - genre. Pick it up now so you can be in on all the conversation about this book ... and if you don't hear conversation about this book? Start talking. Believe me, after you've read The Crossover, you'll have plenty to say.